Bagutta is an Italian brand, which specialises in shirts. It was founded by Pino Gavazzeni in 1975; nowadays it belongs to CIT Spa. Bagutta shirts are manufactured in Italy. They feature thin troca buttons (without shanks), single-needle stitching (but it’s not the best example of this tecnhique), fused collars with removable collar stays, gussets (not always), split yokes (not always). No hand-stitching. Sleeves are sewn on as usual. Stiitch density: 6-7 stitches per 1 cm. The brand uses 100% cotton, 100% linen, cotton+polyamide and linen+cotton fabrics. The quality of these fabrics varies; sometimes it’s not impressive at all, but sometimes the fabrics are very good. Some Bagutta shirts are made of David & John Anderson shirtings (sometimes even certified Sea Island, sometimes extra-long staple cotton from Egypt). 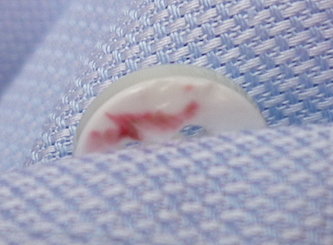 It must be added that Bagutta offers easy care shirts with non-chemical treatment (Perfect line). Weaves: poplin, royal oxford, twill, denim. Bagutta shirts are offered in solid colours (white, blue, grey, black) and various patterns (checks, stripes, dots; sometimes very bold patterns like large paisley, flowers or fancy prints). Collar styles: cutaway, button-down, spread, semi-spread. Sizes: 38 – 44 cm. (= 15 – 17.5 in). Extra slim fit, slim fit, classic fit. Short and long sleeves. You can buy Bagutta shirts at Raffaello-Network.com, Kamiceria.com, Tsum.ru (only Russia) or in Bagutta boutiques in Milan (or at Yoox.com). Prices start approximately at 100 EUR (incl. VAT). Sometimes Bagutta shirts are put on sales (up to 70% off). Bagutta shirt. 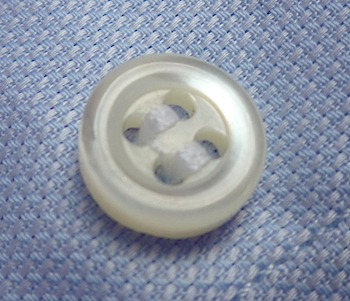 Troca buttons, single-needle stitched seams and armhole.